We specialise in making custom Fume Cupboards to suit your specifications. Whatever your requirements, we can help you. Contact Us Today! Edulab is a leading UK manufacturer of bespoke fume cabinets and cupboards for educational and commercial laboratories. We can customise every aspect of our units, including depth, width, height, materials used, number of electrical sockets, gas taps, water taps, sinks, sashes and stand options. We offer a wide selection that ranges from portable fume hoods to fixed, filtered fume cupboards. We can build a simple light duty enclosure, a sophisticated hood or specialised ventilation equipment for unique applications. A laboratory fume hood provides localised ventilation and protection against toxic fumes, vapours and dust. It also protects against chemical spills and fires by acting as a physical barrier. For these reasons, selecting a high-quality fume cupboard is essential for minimising risk of injury. We use Virgin medical grade welded Polypropylene which offers much higher chemical resistance than materials used by competing products (such as mild steel with a thin coating) and generally see a higher energy/cost efficiency. 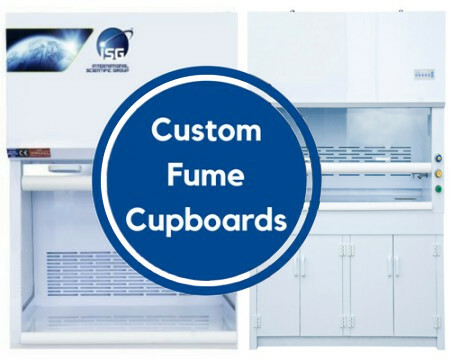 Before selecting the components for your custom fume cupboard design, you’ll need to know exactly how the unit will be used and what processes will take place inside it. As part of this, we recommend you get a chemical assessment done. We take the time to understand each situation and recommend the most suitable equipment for your needs. Every unit supplied must have adequate air supply to ensure that airflow is maintained at the minimum of 0.5m/s inflow as recommended by the British and European requirements. As part of our bespoke service we can install an airflow alarm in your unit. There are two types of fume hood; ducted and ductless. Ducted hoods expel contaminated air outside of the lab, whereas ductless hoods filter out the dirt and chemicals before recycling clean air back into the room. Both types have their pros and cons - for example, ductless hoods are more energy efficient and easier to install and relocate, while ducted hoods require less maintenance and monitoring by laboratory staff. The right option for you depends on how your fume cupboard will be used and the space you have available. Base cabinets provide support for the benchtop units and can form part of your custom fume cabinet if required. We can produce cabinets suitable for storing solvents, acids or for vacuum pump storage, in the size you require. We don’t charge any additional premiums on top of your requirements and will always find a solution for every project. For helpful tips, browse through our article on "How To Choose The Right Fume Cupboard".